Coconut Custard came about because I wanted to cook something unique on the grill. Inspired by thinking about fancy looking things that I imagined Martha Stewart might do (WWMD?). A clever presentation. I wanted to grill in the edible serving dish. A coconut came to mind. Sometimes here at Grilling Companion we go out on a limb and experiment, hopefully to your benefit. Sometimes it works, sometimes not. This recipe is a second attempt. My first attempt was a Coconut Brownie that just didn't work out like I hoped. I wound up with brownie on top, and uncooked brownie underneath (still tasty, BTW). The Coconut Custard turned out even better. Normally you cook custard in a water bath. The brownie failing suggested to me that the coconut provided too much insulation for normal baking. But it worked in place of the water bath, added extra flavor to the custard, and smelled wonderful while grilling. The smell of roasting coconut is fantastic. 1Pre-heat the grill to 325 to 350 degrees. 2Cut the coconuts in half. I used a hacksaw to get through the husk, then a sharp pairing knife to cut through the meat. It is best to draw a line all the way around before beginning sawing and cutting. Cut it such that there are two even halves. Drain and discard the coconut water. 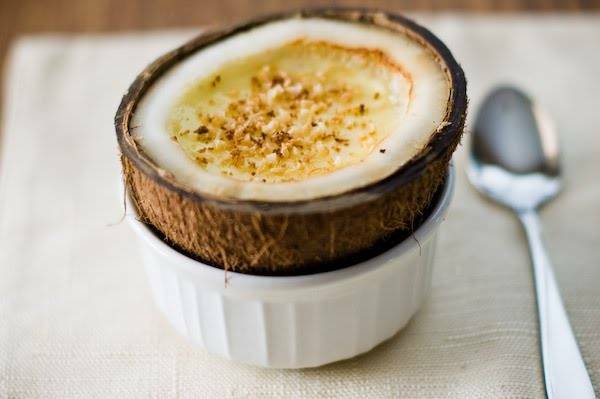 3Shave off a bit of coconut from each half and set aside for making toasted coconut topping. You should have enough to create about 1 tablespoon of toasted coconut. 4Wisk the eggs, sugar and salt until mixed. 5Heat the milk in a sauce pan until it is steaming. 6Slowly and carefully add the milk to the egg mixture. Go slow so not to curdle the eggs. Stir until the sugar is dissolved. 7(Optional) Strain through a fine mesh strainer. This removes some of the tougher parts of the egg yoke, but they are only small bits that won't matter much if you don't have a fine mesh strainer. 8Wrap the husks of the coconuts halves in aluminum foil to protect them from the open flame. 9With another piece of aluminum foil, crumple it to make a ring for each coconut to hold them upright. 10Fill each coconut 3/4 full. 11Add the coconuts to the grill such that they are cooking indirect, i.e. not directly over the open flame. 12Close the lid and grill for about 50 to 60 minutes until the center has congealed and you can insert a knife and pull it out clean. 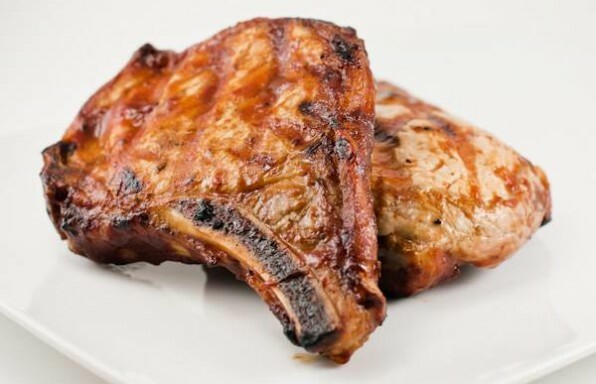 As always, it may take longer or shorter, depending on your grill. Remove from grill and let rest. The residual heat will cook the custard the rest of the way. 1Mince the pieces of coconut that you shaved off earlier. 2On a piece of aluminum foil, spread out the minced coconut and put in a 300 degree oven for about 15 to 20 minutes until a nice brown color. 3Stir about every 5 minutes while cooking. 4Sprinkle the toasted coconut over the custard. 5Serve warm or refrigerate and serve cold.